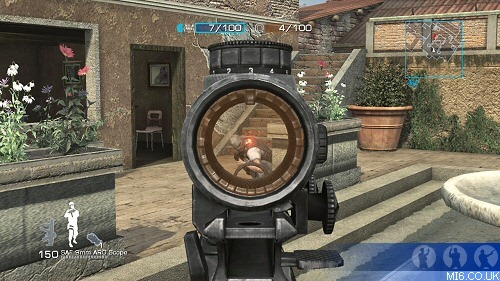 The Multiplayer mode brings the frantic shooting online (and System Link mode) with up to 12-player simultaneous support. 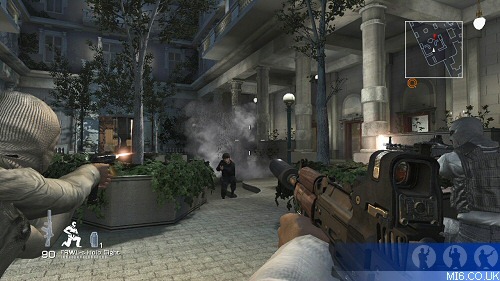 Bond Versus – One player plays as Bond while the rest play as the Organization. Bond is a one-man army sent in to disarm explosives and eliminate the Organization. The Organization tries to protect the explosives at all costs. Bond wins if he can disarm the explosives or eliminate all Organization members. The Organization wins if Bond is killed. Every player gets a chance to play as Bond; the player with the most points wins the match. Bond Evasion – One player plays as Bond while the rest of the players are split into MI6 or the Organization teams. 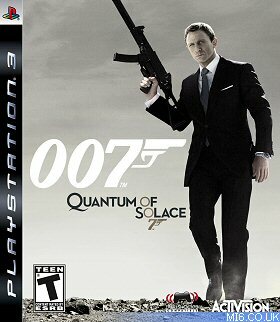 MI6 players must protect Bond as he tries to make it to the escape zone. If Bond successfully escapes then MI6 wins, if Bond is killed then the Organization wins. One player is randomly chosen as Bond each time a match begins. Golden Gun – All players try to gain possession of the Golden Gun. The Golden Gun is a one-hit kill weapon, making it difficult to pry it away from the user. Pay attention to the Golden Gun icon in your map to pinpoint its location. Only Golden Gun kills will count in this mode. Multiplayer map sizes range from small to medium to large. This allows for a variety of strategic approaches when playing them on different game modes. Note that some of the maps allow you to explore areas that were off limits in the Single Player game! Barge – The Barge has two levels: the upper and lower decks. The narrow ship design is perfect for Golden Gun or Bond Evasion. Construction Site – This level features multiple floors, perfect those who like climb towers and snipe. The large and spread-out design of this level is best suited for larger gatherings, like Team Conflict and Territory Control. Dock – There are lots of nooks and crannies and places to hide here. The Dock is ideal for Classic and Conflict mode. Eco Hotel – Take cover behind the vehicles and watch as mayhem breaks out in the parking lot! This small but open level is ideal for a Golden Gun scramble. You can choose your load-out gear in a multiplayer game by selecting Agent, Saboteur or Assassin, but customizing your own gear is even better. Use points earned in multiplayer matches to purchase weapons, grenades, gadgets and attachments in the Weapon Store menu. Your custom configurations will remain throughout your multiplayer session. Two “mix” playlists are available: Teamwork (Team Conflict, Bond Evasion and Territory Control) and Mayhem (Golden Gun, Classic and Conflict). Note that these selections have their own preset time and score limits. Embassy – This level features several indoor/outdoor areas, including rooms, balconies, courtyard and rooftops. Good for Bond Evasion or Bond Versus. Chemical Plant – The chemical plant has a very old-school Bond feel with its industrial design, making it perfect for Classic mode. Italia – With visually pleasing architecture, including balconies and elaborate buildings, Italia brings sophistication to the battle. Note the deterioration of the statues as the shootout intensifies. Concourse – The guilty pleasure of an all-out shootout in an airport terminal is hard to resist! How did all those weapons make it past TSA security? Rooftop – Lots of cover areas and secret nooks can be found for those who explore. Spa – A small area with tight quarters; ideal for a frantic Golden Gun match. Science Center – This level shows the Science Center during the day as opposed to the night setting in the Single-Player story. Siena – Another level with many nooks and crannies and sniper areas. The large level map makes it best for Conflict and Team Conflict.